SPY GUY#1 Inking is DONE! 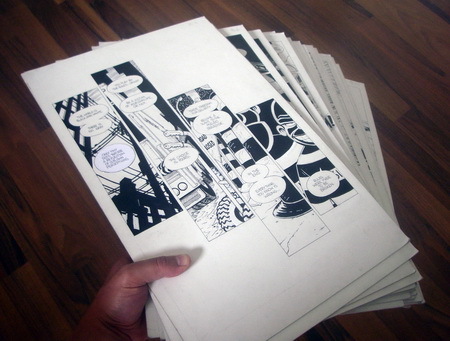 These pages have now been inked and scanned. What is still left to do? Just over a week to go before sending it off to Lebonfon for printing. This morning I began painting the background for the cover of SPY GUY #1! 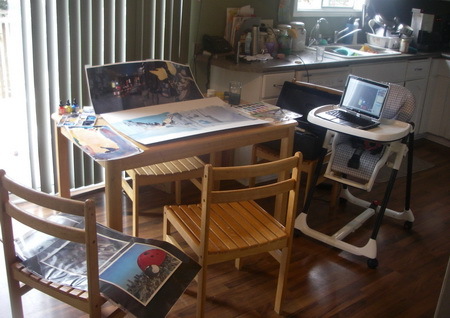 While the family was away today, production migrated upstars into the temporary Kitchen Studio. Click to see the tag labels (on flickr). The last time I painted anything like this was way back in 2001 when I did the cover for SPY GUY: Bootleg. Crikey, that was a long time ago!